Osteopathy and Swedenborg: The Influence of Emanuel Swedenborg on the Genesis and Development of Osteopathy, Specifically on Andrew Taylor Still and William Garner Sutherland. The Trinity was defined at the Council of Nicaea and the relationship of the human and divine natures of Christ was defined at Chalcedon. Very few questioned the Church's depictions of the nature of God. Two such mavericks, Michael Servetus (1509-1553) and Emanuel Swedenborg (1688-1772), in spite of their Christian educations, rejected the Church's creedal understanding of God and the Trinity. Although they lived in two different ages--the Reformed and Enlightenment, and there is no evidence that Swedenborg ever read or even knew of Servetus--the two men came to remarkably similar conclusions about the Nature of God. Each scholar stated that the Trinity does not rest in three Persons, but rather takes form in the single person of Jesus Christ, the visible God. The essays in this volume testify to the far-reaching effects of Swedenborgs works in Western culture. From his early days as an ambitious young scientist in the ferment of eighteenth-century Enlightenment Europe, through his mid-life entrance into an ongoing experience of the spiritual world, to his last decades as a researcher of things spiritual, Swedenborg built a career that left a unique legacy. His vivid descriptions of the nonphysical realm made a powerful impression on minds as diverse as Goethe, Blake, Emerson, Yeats and Borges. From the inside cover: �The great German scholar Ernst Benz documents the rich and fascinating life of Emanuel Swedenborg, who claims an exceptional place in history both as a scientist and a visionary.� Following his life and his mission, Benz explores Swedenborg�s life and the impact it has had on the world. Forget what both scientists and the clergy have told you about the ultimate reality. This extraordinary book shows you how scientists have misinterpreted the laws of the physical universe and how theologians have misinterpreted the revealed wisdom of the Lord God's Holy Word. Fasten your seatbelt! Prepare yourself for the new laws of physics and the new theology that will fulfill God's promise of making "all things new!" "Swedenborg's Hidden Influence on Kant" by Gottlieb Florschutz (2014), is a careful tracing of the parallels between Kant and Swedenborg's views on the soul, life afterdeath and the metaphysical importance of moral goodness. In this book, Jose Antonio Anton-Pacheco tackles subjects as diverse as the nature of unity and the way that the Divine manifests in the world; the nature of human beings as they relate to the higher realms, and specifically Swedenborg's concept of the Grand Man or Universal Human; the mystical nature of Swedenborg's interpretation of the Bible; and the nature of time and space in the spiritual world. Alongside his exploration of Swedenborg's thought are examinations of Swedenborg's influence on a variety of different thinkers and authors, from Jorge Luis Borges to Ibn 'Arabi. This book was originally published in Spanish as El profeta del norte: Un libro sobre Swedenborg. 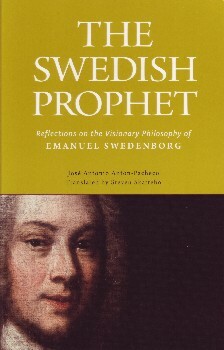 Perfect for scholars and serious students of Swedenborg's thought, Anton-Pacheco's powerful writing casts a new light on the Swedish prophet. ISBN: 9780877853428, 186 pages, 5.5 x 8.5 inches, paperback, 2012.